PEMF Therapy - A Cure for Insomnia? In this article we are going to look at the mystery of sleep, why we need it, the many benefits sleep provides, the current epidemic of insomnia and sleep disorders, and most importantly practical solutions to help you get better sleep ... starting tonight! The main focus of this video is how PEMF therapy assists with better sleep, but I will explain other practical solutions as well. So I recommend grabbing a pen and paper because I am going share some very important tips on how you can get better sleep each night so you can feel more alive and energized in the day! But there is a big problem, sleep disorders are becoming more and more of an epidemic. What Is Sleep and Why the Heck Do we Need it? From an evolutionary point of view, sleep is a BAD idea. If you are an animal out in the jungle the LAST thing you want to do is be motionless, defenseless and vulnerable for several hours a day. But sleep fought evolution and won. Yet sleep happens in ALL species of animals without exception. This shows us just how vital sleep is for life to exist. It is Essential at most basic of biological level. For humans Its an essential element and the average person would die after 10 days with no sleep, making it more essential than food (which we can survive 30-90 days or longer without). There are five stages of sleep. 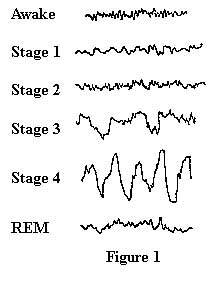 Stages one through four range from light sleep to deep sleep, and stage five is REM sleep. Non Rem or dreamless Sleep. Stages 1-4 (dreamless sleep). Slow lazy brainwaves. Slow wave sleep vital for regeneration. REM is one of the lightest stages of sleep. REM sleep occurs about every two hours throughout the night. 90 minutes. Rollercoaster ride through the stages of sleep. Half night most deep sleep. Brain dreams in REM. Brain goes completely out of its my mind. 25% paralysis … hiccups. Anxiety. REM sleep (processing the day's events) is especially important and must not be cut short. Sleeping pills reduce REM sleep and therefore prevent a restful sleep. They are usually taken in high doses - to be sure - and can lead to dependence. Sleep disorders are often the first signs of depression. Directly after REM, the body descends into a deep sleep. Eventually, sleep will lighten and REM will occur again. Deep slow wave sleep gets hit the hardest as we age. 70% drop in deep sleep as we age, and that accounts for 50% drop in memory. 3) Your body releases important hormones (HGH and Melatonin). 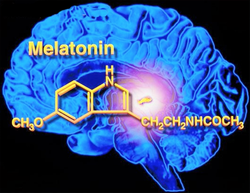 2) The Cyclical Secretion of certain hormones, mainly Melatonin in the Pineal Gland. 3) And the cumulative effect of hypnogenic molecules that build up in the body while you are awake, Mainly Adenosine, which is sometimes referred to as the Sleep Molecule. As we'll see PEMF therapy assists the body on all these levels to sleep better. Adenosine - The Sleep Molecule? Adenosine is produced by the degradation of adenosine triphosphate (ATP), the molecule that serves as the “energy currency” for the body’s various cellular functions. The amount of adenosine produced in the brain thus reflects the activity level of its neurons and glial cells. The brain’s intense activity during periods of wakefulness consumes large amounts of ATP and hence causes adenosine to accumulate. Accumulate adenosine in brain to create sleep preside. Two types of adenosine receptors seem to be relevant to the sleep function, A1 and A2A. Interestingly Caffeine acts as an antagonist to Adenosine Receptor sites tricking the brain into thinking there is not as much Adenosine as there really is. 7 1/2 hours - 8 hours. daytime fatigue. Fatigue… micro sleeps.. zone out. Sleep inertia… takes time to warm. Adenosine builds up in a time until you need sleep. Sleep dissipates pressure. Nap dissipates pressure. 1 in 10 people suffer from chronic insomnia and it can really negatively affect the quality of life in a big way. Also, according to the Nation Sleep foundation 60% of Americans report having sleep problems a few nights a week. Increased risk of heart disease, cancer, diabetes, weight gain and overall accelerated aging. Prepares brain like a sponge for learning. 40% deficit in making new memories with sleep depravation. Aceing and failing exam. based on research. Sleep and memory as you get older. Capacity for learning and memory. Sleep starts to detoriate as you get older. Edison understood creative brilliance sleep. Sleep loss and emotion. Stable mental health. Sleep and emotion interact. Didn't sleep well == bad mood. Sleep on it.. Sleep on a problem… Common in most all languages. Transcend cultural boundaries. Sedative / hypnotic. -- sedate you. Common common ratio of non rem sleep. Throws off patterns. Aldehydes and ketones repress rem sleep (from alcohol). When alcohol is washed, REM sleep rebound effect. Intense dreaming. After pain relief, the most positive feedback I receive from people is better sleep and relaxation. It is estimated that 60% of Americans have trouble falling asleep according to the National Sleep Foundation (stress, apnea, stimulation, complications due to medication, etc.). Even healthy people can have intermittent nights of restlessness and lack of deep sleep. If you use a PEMF therapy mat with a proper biorhythm clock, it will have a nighttime setting with theta-delta frequencies that help induce the brain with the commonly known frequencies for sleep and deep relaxation (delta and theta frequencies are around .5-7 Hz). These pulsating magnetic frequencies at the lower theta and delta frequencies directly and tangibly assist the mind and body to have a deep and rejuvenating nights rest. When I first got an earth-based PEMF therapy mat back in 2007, I noticed I got to sleep easily and slept deeply. That was a point in my life where I was having problems sleeping. Since I have been using PEMF therapy daily, I have no more problems sleeping soundly every night. I’ve heard directly from hundreds of users that better sleep is one of the first things they notice, AND it was one of the most important factors to their healing and recovery. I’ve heard many stories of people with serious health issues who had terrible insomnia. They felt tired, sick, depressed, day in and day out. After JUST ONE NIGHT of sleeping deeply, they would call me telling me how they felt like a new person! Most People hit bed 30-40 Hz... Need to slow down brain. PEMF works through resonance. PEMF fields cause resonate effects in the body… Wine glass shatters Ella Fitzgerald (opera singer). Introduce frequency patterns into body and brain. Normally we are 13-40 Hz. Hit the pillow at 40 Hz… You have to SLOW THAT BRAIN DOWN! Slow down and falls asleep. Use external field influences that are specially resonant to brain frequencies to slow the brain down. Our brain cells are very dynamic, very electrical (EEGs), and very influenced influenced by external PEMFs and will begin to resonate with pattern thats around. Brain begins to oscillate to external fields. Our brain, nervous system, organs, tissues and cells very susceptible to external fields. Research - 4 Week Double Blind Study on the effect of PEMF Therapy and Insomnia (using 101 patients). Research has also shown that Pulsing magnetic fields (especially the Schumann and geomagnetic frequency) stimulate the production of Melatonin in the pineal gland. Melatonin is one of the most important hormones for sleep and anti-aging. It is a powerful antioxidant that has been research proven to be oncostatic, which means it protects the body from cancer. PEMF therapy also helps with the production of HGH (Human Growth Hormone) in the pituitary gland. HGH is another vitally important hormone for sleep, rejuvenation and longevity. 5) Lower Intensity (More is NOT better)... especially at night. In this video we are going to give practical action steps you can take to improve the length and quality of your sleep based on what I am calling the FIVE Elements of Better Sleep. Earth is food, water is hydration, fire/light is light dark cycles, air is oxygen and temperature and the fifth element is PEMF or your brain waves. I'll share with you the connection between your INNER biological clocks and the outer environmental cues... This is the science of chronobiology and when applied to the daily cycles is called circadian biology. As we'll see this is THE KEY to getting better sleep... That is getting your biological clocks back in sync. PEMF therapy is one of the most POWERFUL and effective ways to relax the body and mind and slow down the brain waves which prepares the brain for sleep. But along with PEMF therapy, I will share many other practical tips you can implement to start sleeping better TODAY. Circadian Rhythms Daily, but other cycles fall under Chronobiology. While we as humans have internal biological clocks, We have also evolved closely entangled and connected to the elements our environment. The 5 elements of better sleep is really about mastering the rhythms of the five elements. Our modern lifestyle has disconnected us from the earth and her elements. A circadian rhythm /sɜrˈkeɪdiən/ is any biological process that displays an endogenous, entrainable oscillation of about 24 hours. These 24-hour rhythms are driven by acircadian clock, and they have been widely observed in plants, animals, fungi, and cyanobacteria. The term circadian comes from the Latin circa, meaning "around" (or "approximately"), and diēs, meaning "day". The formal study of biological temporal rhythms, such as daily, tidal, weekly, seasonal, and annual rhythms, is called chronobiology. Although circadian rhythms are endogenous ("built-in", self-sustained), they are adjusted (entrained) to the local environment by external cues called zeitgebers (zite-gayber), commonly the most important of which is daylight. In humans, shift-work that favors irregular eating times is associated with altered insulin sensitivity and higher body mass. Shift-work also leads to increased metabolic risks for cardio-metabolic syndrome, hypertension, inflammation. WIND Down - 20 Min - Prep for next day - 20 Min Personal Hygiene - 20 min Read Relax in Bed. Avoid Caffeiene == try Chamomile or other sleep teas. Caffeine .. Adenosine. Caffeine blocks receptors of adenosine. Did you know that people whose offices have windows get better sleep than those who work in windowless workspaces? That’s because getting enough sun exposure everyday keeps your body’s clock – or circadian rhythm – on point. Sunlight tells your body to postpone making melatonin – the hormone that makes you tired and helps you sleep. So it’s a great idea to get some sun in the morning if you can, but if you’re rushing to get to work and don’t have time to take a leisurely walk, you can take your vitamin D supplements in the morning instead. Since sunlight makes your body produce vitamin D, which put offs melatonin production, taking a morning dose of the vitamin may make your body feel like you’ve been outside. (For this reason, you want to avoid taking your vitamin D at night, which can interfere with sleep). No cellphone or TV … READ before bed with blue filter nightlight. Check out www.lowbluelights.com for great tools for better sleep. I mainly recommend their Sleep Goggles, Amber LED light bulbs and Spotlight for reading. They have screens for computers, TVs, tablets, phones, but you can just wear the goggles (or avoid an hour before bed). Slipping between cool sheets helps trigger a drop in your body temperature. That shift signals the body to produce melatonin, which induces sleep. That's why it's also a good idea to take a warm bath or hot shower before going to bed: Both temporarily raise your body temperature, after which it gradually lowers in the cooler air, cueing your body to feel sleepy. Gravity / Posture - bed... pillow... alignment spine. Gravity - The Sixth Element of Health. Make sure your spine is properly aligned when you sleep. If you are a side sleeper, have your partner look at your back, especially the spine to make sure its straight. Putting a pillow between the legs helps. If you are a back sleeper, make sure your neck is not propped up too high. We need grounding. Absorbing electrons on the barefoot. Electronic state can get out of balance. PEMFs cause resonant effects in the body. Normally we are 13-40 Hz. Hit the pillow at 40 Hz… You have to SLOW THAT BRAIN DOWN! Shift into 1st gear. Our brain, nervous system, organs, tissues and cells very susceptible to external PEMFs. The iMRS 2000 and earth based frequency PEMF devices provides a form of pulsed resonance that has been shown to enable restful sleep to the body. After pain relief better sleep is easily the 2nd most common positive testimonial I have receivd. And there is PLENTY of research showing PEMF improves sleep in both humans and animals (animals have no placebo). Even if I miss my morning or daytime application , I am sure NOT to miss using the iMRS right before bed. Sleep always effortlessly follows (like clockwork). Here is the proven protocols for using the PEMF for better sleep. Use level 25-50 in the morning, level 25-50 in the afternoon and level 10 at night. The duration of the application should be 8-16 minutes. If possible use a light and sound system as well for ADDED relaxation. Currently as of this video the iMRS 2000 is the only PEMF system available in the U.S. with an integrated light and sound system. Lay on an earth based PEMF mat each night for 8-24 minutes before bedtime using low theta-delta frequencies (.5-3.0 hz ideally. The autonomic nervous system has two primary components: the sympathetic and parasympathetic systems. Simple put your parasympathetic system is your REST, DIGEST and HEAL system whereas you sympathetic system is your FIGHT, FLIGHT or FRIGHT system which gets your body ready for stress. It basically is a number that summarizes your ability and flexibility of your central nervous system in handling stress and balancing that with rest and relaxation. Regulation rigidity refers to the body being stuck in sympathetic or parasympathetic mode and having difficulty finding balance. Heart Rate Variability (HRV) is a biomarker of cardiac sympathetic activity. People with high HRV are more stress tolerant and resilient in the face of stressful environmental changes. It is also a good predicator of sudden death, especially sudden cardiac death (or the prevention thereof). When you are relaxed, you have a rhythmic heart rate variability, or the amount of time between each beat. Under stress, your body resorts to a fixed, inflexible rhythm. HeartMath technologies (like the emWave2 or the Inner Balance™ Sensor) use a tiny sensor to calculate your heart rate variability, and warns you that you are showing signs of stress (perhaps before you even realize it). The sensor guides you to take deep breaths every five seconds as you listen to music or meditate to resume relaxed heart rate variability. By warning you that you are getting stressed, and teaching you to prevent stress before it starts, you can stay more focused, controlled, and in better moods. When you meditate, you practice the art of mindfulness, which allows you to choose which thoughts you want to focus on. It allows you to choose how you respond to your feelings instead of blinding reacting to them. Different ways of meditating include counting, mantras, mindfulness, positive self-talk, and controlled breathing exercises. Taking a few minutes a day to do a gratitude and forgiveness exercise can be unbelievably beneficial. In fact, it’s probably the most powerful biohack ever. Either stop everything you’re doing and consider what you are grateful for, or write your thoughts about gratitude and forgiveness down in a journal (like The 5-Minute Journal). By doing this, you can increase your happiness, recover more easily from stress (I mean, how much stress do you carry around from your anger and hurt? ), and become more effective at work. In fact, gratitude exercises are shown to increase decision making abilities and encourage productivity. It also makes you generally more likeable.